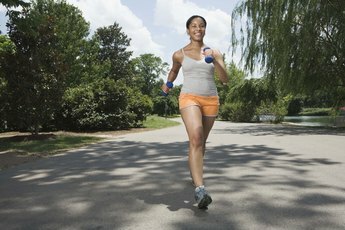 Burn excess calories with regular runs. To lose 20 pounds of fat you'll need to burn 70,000 excess calories -- the equivalent of 350 200-calorie candy bars. This may seem like a lot, but it's not an unreasonable amount of weight to lose in three months. Run regularly, eat healthy foods and track your calories to meet this goal. Run for at least one hour and 15 minutes per week. You should break this up across the week, such as running for 25 minutes three times a week. This is the Center for Disease Control and Prevention's recommendation for weekly activity. 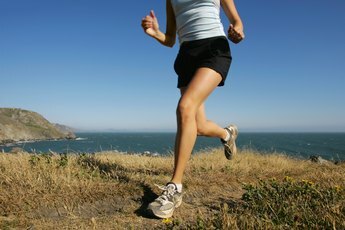 This is a minimum number -- running more than that will make weight loss easier. Determine how many calories you need to consume for weight maintenance. This number will be based on your age, weight, height, gender and activity level. You can do this using the Daily Food Plan at ChooseMyPlate.gov. If you prefer, consult with your physician or dietitian to find out your required calories for weight maintenance. You will use this number later to calculate your calorie deficit. Track how many calories your burn from running. You can use a heart-rate monitor with a calorie feature or you can use an online calculator to estimate your calorie burn, such as the ones at HealthStatus, ExRx.net or Runner's World. Your calorie burn will depend on your weight and speed. 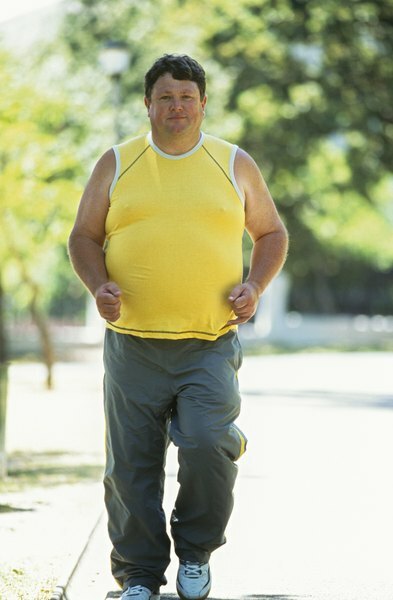 For instance, according to ExRx.net a 150-pound person running at 4 mph will burn 219 calories in 30 minutes, while a 200-pound person running at 8 mph will burn 630 calories in the same amount of time. Create a daily calorie deficit of 778 calories. For instance, if you burn 500 calories running, you would need to cut an additional 278 calories from your diet to create the required deficit. So if your daily required calories for weight maintenance is 2,000 you would only consume 1,722. A daily deficit of 778 works out to about 70,000 calories over three months. Because you need to burn 3,500 excess calories to lose a pound of fat this adds up to 20 pounds in three months. This is a loss of about 1-1/2 pounds per week. A 778 calorie-a-day deficit is within the healthy calorie deficit range for weight loss recommended by the University of Washington. You can cut fewer calories to slow the weight loss or slightly more to speed it up. You should keep your calorie deficit within the range of 500 to 800. Eat a healthy diet to make sure you get the nutrients you need when losing weight. Your diet should include fruits, vegetables, whole grains and legumes. When choosing milk products aim for fat-free and low-fat options, like skim milk instead of whole milk. Get your protein from sources that are low in saturated fats like lean cuts of meat, fish, eggs, nuts and soy products. Avoid foods that are high in saturated fat, choleterol, sodium and refined sugars. Women should always consume at least 1,200 calories a day unless following a medically supervised diet. For men this number is 1,500. Always check with your physician before starting a new diet, exercise and weight-loss routine to see if it's right for you. Does Rock Climbing Burn Fat? Does Running Actually Make You Lose Weight? Does Running Up an Incline Make You Lose Weight? Does Running Stairs or Laps Make You Lose Weight Faster? 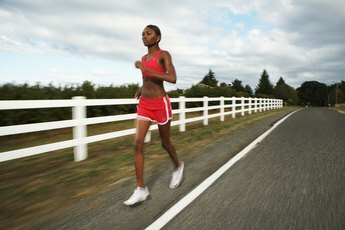 Does Running Speed Up Your Metabolism?